Hurricane Hector continued to move west through the Central Pacific Ocean when NASA's Aqua satellite passed overhead and saw the storm's large eye that was a result of eyewall replacement. Now that Hector has passed the Hawaiian Islands and is headed west, a tropical storm watch is in effect for Johnston Island. A tropical storm watch means tropical storm conditions are possible within the next 48 hours. On the forecast path, the center of Hector is expected to pass to the north of Johnston Island late Friday, Aug. 10. At 5 a.m. EDT (0900 UTC) on Aug. 9 (11 p.m. HST on Aug. 8) NOAA's Central Pacific Hurricane Center said "Based on reflectivity data from the South Point WSR-88D radar om the Big Island, microwave images, and satellite data, it appeared that Hector went through an eyewall replacement cycle late this afternoon. Since this reorganization of the hurricane appears to be complete now, the eye of Hector has warmed and become much better defined in infrared satellite imagery during the past few hours." 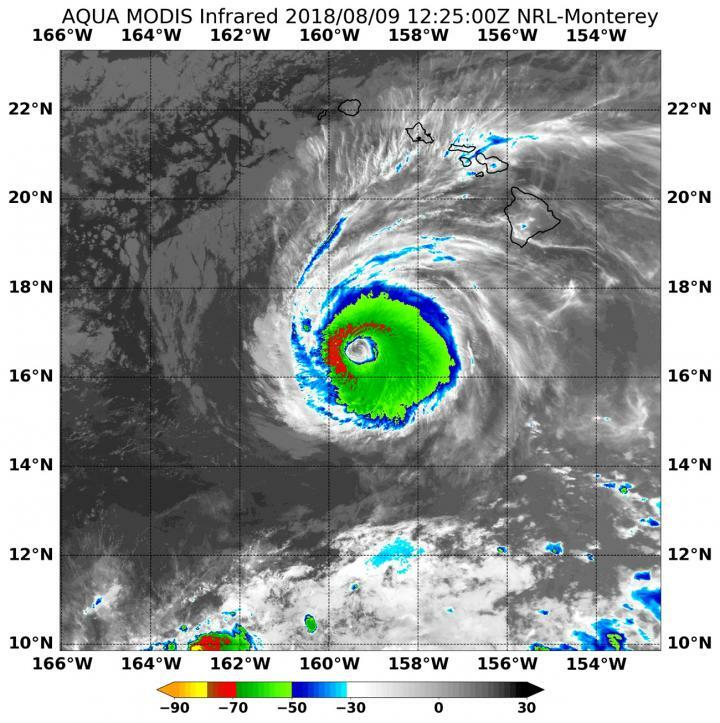 On Aug. 9 at 8:25 a.m. EDT (1225 UTC) the Moderate Resolution Imaging Spectroradiometer or MODIS instrument aboard NASA's Aqua satellite analyzed Hurricane Hector's cloud top temperatures in infrared light. MODIS found cloud top temperatures of strongest thunderstorms were located west of the center. In that area, cloud top temperatures were as cold as or colder than minus 70 degrees (red) Fahrenheit (minus 56.6 degrees Celsius). Cloud top temperatures that cold indicate strong storms that have the capability to create heavy rain, so the heaviest rain was likely falling on Hector's western side. At 11 a.m. EDT (5 a.m. HST/1500 UTC), the center of Hurricane Hector was located near 16.6 degrees north latitude and 160.1 degrees west longitude. Hector was moving toward the west near 16 mph (26 kph) and this general motion is expected to continue through today. A gradual turn toward the west-northwest is expected from tonight through late Friday. Maximum sustained winds are near 120 mph (195 kph) with higher gusts. Hector is a category 3 hurricane on the Saffir-Simpson Hurricane Wind Scale. Little change in strength is forecast through Friday night. The estimated minimum central pressure is 957 millibars. Swells generated by Hector should begin to impact Johnston Island tonight. This will likely produce large and dangerous waves along portions of the island from late tonight through Friday night. Interests in the Northwestern Hawaiian Islands, including Midway and Kure Atolls and the Papahanaumokuakea Marine National Monument west of Pearl/Hermes, should monitor the progress of Hector. This does not include the main Hawaiian Islands.